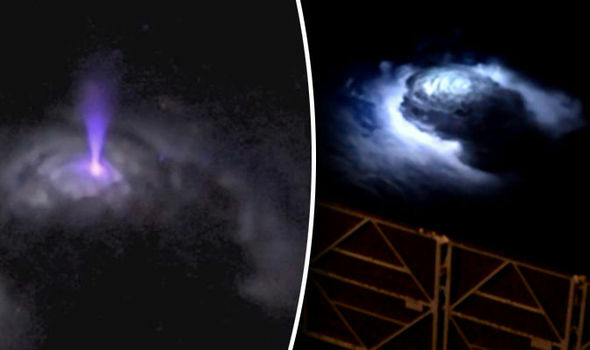 A Danish astronaut abroad international Space Station captured the strange moment "elusive blue jets" burst from a distant cloud on camera which has outstretched more questions than answers. This mysterious occurrence, which was also recorded two years ago from onboard the International Space Station (ISS), seems to be a frightening thunderstorm unfolding in space. This mysterious phenomenon was captured using the station's most sensitive camera, but it still remains a mystery. It has puzzled scientists so much that the European Space Agency (ESA) are about to start numerous experiments this year to "observe the energetic blue jets" shooting up out of clouds. For past several years, the reality of the gigantic blue jets has been pondered, with the scientific community mainly dismissing them - regardless of contrary reports from astronauts in aboard international space station. It is not every day that you get to capture a new weather phenomenon on film, so I am very pleased with the result – but even more so that researchers will be able to investigate these intriguing thunderstorms in more detail soon. The blue discharges and jets are examples of a little-understood part of our atmosphere. Electrical storms reach into the stratosphere and have implications for how our atmosphere protects us from radiation. The Danish-led enquiry, called the Thor Experiment, into the "surprising blue jets" established that the blue beams propagated to 25 miles out of the cloud before completely vanishing. These beams can reach speeds of up to 360,000kph (220,000mph) and they can be certainly missed by the human eye. We wanted to see what happens above a thunderstorm. What we see is that at the top of the cloud in what we call the 'turrets', there is incredible activity. They were dancing over the top of the cloud, and we called them glimpses. But it's only a first step and we need to find out more.